Go from a shy reporter to America's iconic superhero in this classic Superman costume for adults. 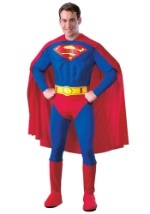 The costume includes a blue, polyester jumpsuit that features attached, red briefs and displays the Superman logo on the chest. A yellow belt tops off the briefs and the jumpsuit also has attached, red boot tops. A cape attaches around the neck and flows freely down the back. Save Metropolis this Halloween season in this classic costume.